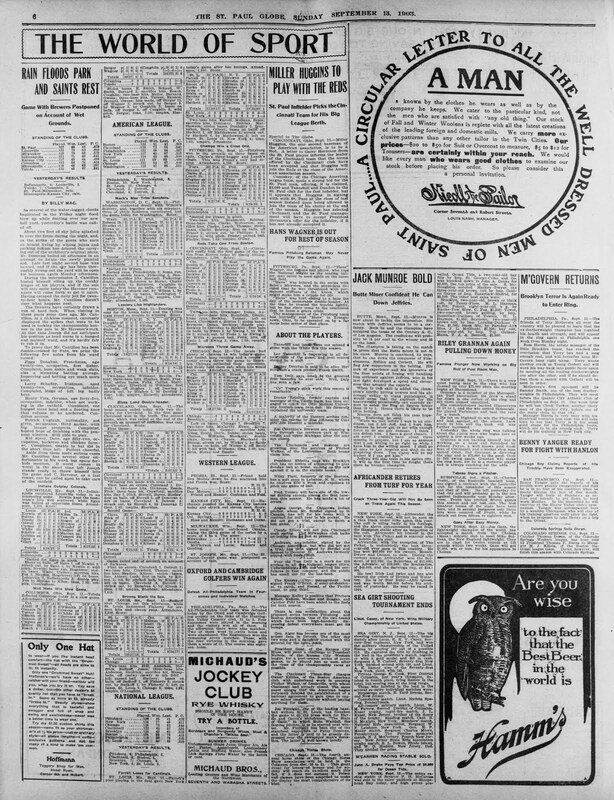 The previous day's game had been rained out, and in the absence of a game report the reporter decided to amuse his readers (and likely himself) with a rather colorful report on the Brewers' mounting injuries. As several of the water-logged clouds implicated in the Friday night flood blew up while floating over our new ball yard, yesterday's battle was called off. About two feet of sky juice splashed in over the fence during the night, and, as the strike of the gents who earn an honest living by wiping joints and packing oakum has delayed the carrying out of the architect's original plans, Mr. Donovan bailed all afternoon in an attempt to locate the newly planted sod. Late last night second base was located, and if the sky has been thoroughly wrung out the yard will be open for business again Monday afternoon. During the intermission J. Cantillon busied himself oiling up the creaky hinges of his players, and if the sun will only smile today the Havenor remnants will come forth to get it again. Having escaped the daily jolt for twenty-four hours, Mr. Cantillon doesn't care what happens next. The Brewers have certainly drawn a run of hard luck. When visiting in these parts some time ago, Mr. Cantillon, in a reckless moment, carelessly displayed the spikes that were to be used in tackling the championship banner to the pole in Mr. Havenor's park. At that time Joseph did not anticipate his position as head nurse in a bunged and maimed ward, and it's hardly fair to rub it in. Jiggs Donahue, Frenchman, age twenty-one, occupation, first disher. Complaint, bum ankle and weak slats, but also a slumping batting average. Improving and batting eye much more keen. Larry Schafley, Irishman, aged twenty-two, occupation, infielder. Complaint, hinge of left leg badly bent. Roney Viox, German, age forty-five, occupation infielder, when not working in the outield. Complaint, one bunged meat hand and a floating knee that refuses to be anchored. Condition serious. Patrick Unglaub, nationality, not given, occupation third sacker, with big league prospects. Complaint, busted hope of finishing with the pennant winners. Still able to play. Kid Speer, Dane, age fifty-two, occupation, backstop and chicken farmer. Complaint, unable to bat 450 in the short time left. Patient cheerful. Aside from these more serious cases Mr. Cantillon has several other unfortunates in his ward, but space forbids mention. If worst comes to worst in the short time left Joseph stands ready to throw himself into the game and C. Havenor, as a last resort, can be called upon to take care of the outfield. Not much to add to that, except perhaps to identify some of the participants. "Joseph" and "Mr. Cantillon" is "Pongo Joe" Cantillon, the Brewers' new manager. He had acquired his unusual nickname during his playing career, when a fanciful West Coast sportswriter wrote that the Janesville native was "the son of an Italian nobleman" and his real name was "Pongo Lagazinio Cantillon". The nickname stuck with him through the rest of his baseball career. John Augustus "Jiggs" Donahue had been a catcher for the American League Milwaukee Brewers in 1901, and moved to St. Louis with the rest of the club. He returned to Milwaukee, in the minors this time, for one season before being sold to the Chicago White Sox in 1904, where he would contribute to their World Championship two years later. Second baseman Larry Schafley came to the Brewers after a cup of coffee with the Chicago Orphans (now known as the Cubs) in 1902. He played only the single season in Milwaukee before heading out to Oakland to join the Pacific Coast League club. George "Kid" Speer was a living link to Milwaukee's baseball past. He had been a catcher on the old Western League Brewer club from 1896 through 1899 (the last three years were managed by Connie Mack). Speer spent two years in Buffalo, but when the new Brewer club was formed in 1902, the Kid came back to Milwaukee. Speer's contemporary, Henry Roney Viox, had also been part of Mack's Brewers. He had played in Milwaukee in 1899 before moving to the Cleveland Lake Shores (now Indians) in 1900. He spent 1902 and the beginning of 1903 bouncing around the American Association's clubs in Toledo, Columbus and Louisville before returning to the Cream City to wind up his six-year career. Finally we get to the mysterious man without a country. The Globe might have called him "Patrick", but it was Bob Unglaub who had major-league prospects. And did he ever; after a crackerjack 1903 season, plenty of big league clubs showed an interest. 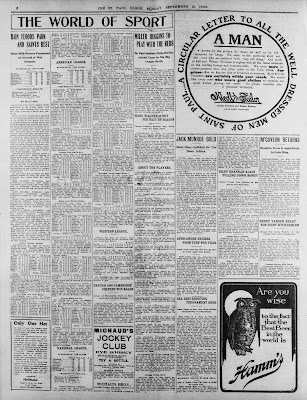 The Brewers settled on Boston and had a deal in principle to send him to the American League, but the terms kept shifting—the Brewers were first reportedly to receive $1,000, then two players in a trade, then money again—so much so that the Milwaukee Journal called Unglaub "the human checker" for being pushed across the board so much. The man doing all that wheeling and dealing was Mister Charles Havenor, the Brewers' founding owner. Havenor was a former Milwaukee Alderman, representing the 4th Ward. In 1904, he was indicted for soliciting an $200 bribe, part of a wave of anti-corruption that snared over seventy politicians and businessmen. He was convicted, and in March of 1905 sentenced to two years in the Milwaukee House of Correction. 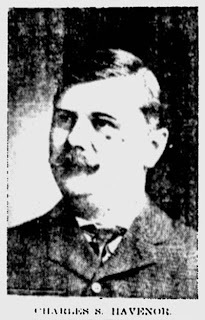 Havenor appealed the sentence, and while I haven't been able to conclusively determine the result of that appeal Havenor remained free and continued to own the Brewers until his death on the eve of the 1912 season, when his widow took over the club. For their own part, these sophomore Brewers managed to put together a very respectable 77-60 record in the 1903 season. Respectable, but still no better than third place, as the American Association clubs finished in the same order as the standings published on that soggy Sunday morning.